You won't ever buy chicken nuggets again. This is the easiest recipe and what's more, you know exactly what's in them! You can also freeze these before cooking so they're a good stand by if you suddenly find yourselves feeding a crowd. Bring a pan of lightly salted water to the boil. Peel the potatoes and cut into slices 1cm wide then 1cm wide chips. Blanch in the boiling water for 3 minutes, then drain. Tip the chips onto a clean teatowel to dry off. Line a baking tray with baking parchment then transfer the chips and arrange in a single layer. Drizzle with olive oil. In a bowl, mix the diced chicken with the pesto, until the chicken pieces are well coated. Whizz up some day old bread in a food processor then put the breadcrumbs in a large freezer bag. Add the chicken and give it all a good shake so the chicken is coated in breadcrumbs. The nuggets can be frozen at this point. Place on a tray in a single layer to freeze before transferring to a freezer bag so they don't all stick together. Line another baking tray with baking parchment and arrange the nuggets in a single layer. Drizzle with a little oil and place the nuggets and chips in the oven for 15 - 20 minutes. After 10 minutes, turn them over. The high temperature will help give the nuggets a crispy finish. Add the frozen peas to boiling water and cook as per the packet instructions. Serve everything together with a good dollop of ketchup. 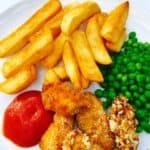 You can prepare the nuggets in advance and blanch the chips then cook in the oven when ready.